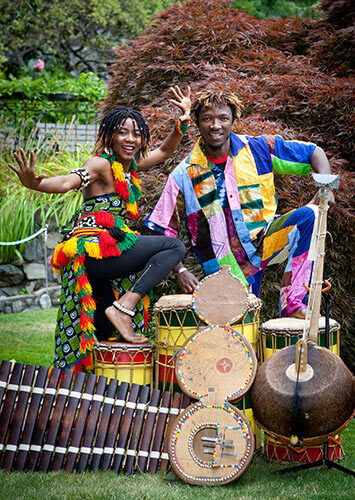 Learn the rhythms of Guinea West Africa with a true Master djembe player, otherwise known as a "djembefola" and a master dancer. Michel and N’Nato offer workshops throughout BC, across Canada and Internationally. Michel has been sharing the rhythms and song of Guinea for over 15 years and has a true gift of sharing the music to both the beginner and the advanced player. He has a patient, yet fun loving way and thorough way of teaching the rhythms. You will learn djembe basic accompaniment parts and the intro, then the dundun, sangban, kenkeni parts to complete the rhythm. Michel is currently teaching a Friday evening class in Victoria from 6:15pm to 7:30pm. Please contact us for the current location. Michel often offers workshops alongside performances with Marafani. Contact us for more information! N’Nato is well known internationally for her skill and complex dance choreographies that she teaches. She has taught throughout Mexico, Japan along side touring with well known artists such as Alpha YaYa Diallo and Les Amazonnes de Guinee. As she is a very popular teacher and is often teaching and touring, we are lucky to get her around. Please take the opportunity to learn from this dynamic and talented teacher and singer. Contact us for more information!